In large resealable food storage plastic bag or 12x8-inch (2-quart) glass baking dish, combine all marinade ingredients; mix well. Add roast, turning to coat all sides. Seal bag or cover dish with plastic wrap. Refrigerate 1 to 8 hours, turning occasionally. When ready to cook, heat oven to 350°F. Place roast, fat side up, on rack in roasting pan; discard marinade. Bake at 350°F. For medium-rare doneness, bake 1 3/4 to 2 hours or until meat thermometer registers 135°F. ; for medium doneness, bake 2 to 2 1/2 hours or until meat thermometer registers 150°F. 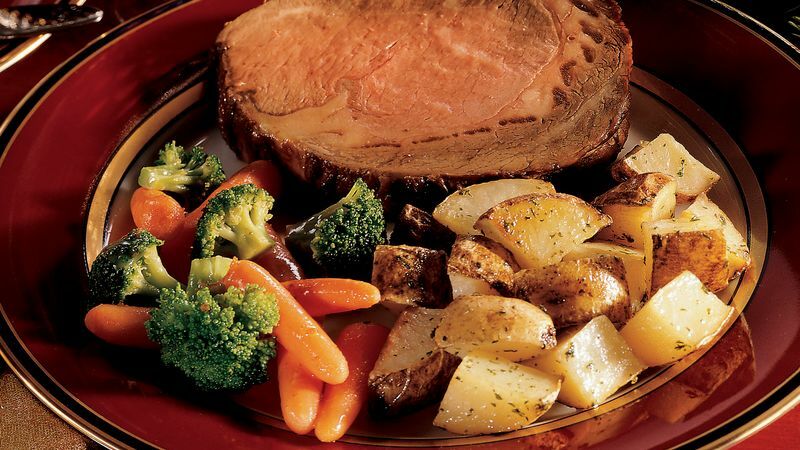 Let roast stand 15 to 20 minutes before slicing.